When your child’s baby tooth is damaged, be it a large cavity or severe decay requiring a baby root canal, it is crucial to repair it as soon as possible to prevent further damage. The enamel of baby teeth is already more fragile than that of permanent teeth, requiring additional support if the teeth undergo any extensive restorative treatment. At Children’s Dental Zone, we offer dental crowns to protect your child’s baby teeth until they are ready to be replaced by permanent teeth. 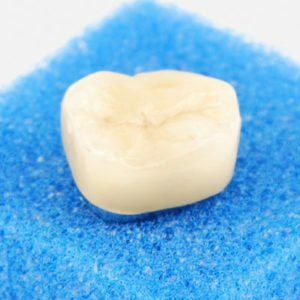 A crown is a protective, tooth-shaped cap placed over and bonded to your child’s baby tooth, in order to prevent the tooth from fracturing or developing a new problem. In addition to removing the infected parts of the tooth, we also shape it so that the crown properly fits onto it, leaving a small segment that cannot properly function on its own. A crown will also prevent a premature extraction of the tooth: It is very important for baby teeth to fall out on their own in order to promote proper growth of permanent teeth. To ensure that your child’s crown lasts until the affected baby tooth falls out, he or she should avoid eating hard and sticky foods. The child should also maintain their regular dental hygiene routine of brushing and flossing twice a day. Traditional stainless steel crowns are durable and can withstand regular chewing, which is why we recommend them for your child’s back teeth, i.e., molars. Tooth-colored crowns, on the other hand, are almost as durable and improve the tooth’s aesthetic appeal, which is why we usually place them in the visible front teeth. Although young children do not often suffer from self-esteem issues in social situations, as a parent you may not want your child’s front teeth to be metallic. If your child has a large cavity or has undergone a root canal on a permanent tooth, the best restorative option is a dental crown. Because he or she will, in most cases, have the adult tooth for the rest of their life, we recommend choosing a porcelain crown. The crown will help prevent any potential self-esteem issues later in your child’s life, as it will remain indistinguishable from natural teeth with the proper care and maintenance. To learn more about dental crowns, please feel free to contact your Johns Creek, GA dentist today!